Rev. Philip M. Clifford, CSV, died at the Continuing Care Center, adjacent to Northwest Community Hospital in Arlington Heights on Sat., Jan. 4, 1997. Phil was 78 years old. Born on August 17, 1918 in Chicago, Phil entered the Viatorian Novitiate at Lemont in September of 1936. He pronounced his first vows on September 8, 1937. 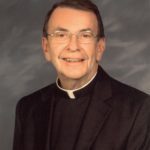 Phil graduated from St. Ambrose College in 1941, completed his theological studies at Kenrick Seminary and was ordained to the priesthood on June 2, 1945. Fr. Clifford then began a long career in Catholic Secondary Education. First, at Cathedral Boys’ High School in Springfield, Illinois, then Phil went East to Stepinac High School in White Plains, New York, next to Spalding Institute in Peoria, IL, and finally out West to Bishop Gorman High School in Las Vegas, NV. Fr. 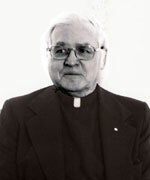 Clifford was appointed Provincial Treasurer in 1968 and served in this position until 1974. Phil again was called to community service in 1980, this time as Director of the Residence Wing of the Province Center. Fr. Clifford retired in 1985. Visitation was held in the Chapel of the Province Center on Tuesday, Jan. 7, 1997 beginning at 4 p.m. and concluding with a Prayer Service at 8 p.m. 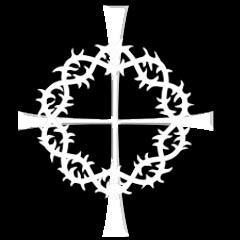 The Mass of Christian Burial took place on Wednesday, Jan. 8, 1997 at 10:30 a.m. in the Chapel of the Province Center. Burial was in the Community Plot at Queen of Heaven Cemetery following Mass. Fr. Clifford was preceded in death by his parents, his brother, Kenrick, and his sister Dolores. He is survived by his sister Helen Blowers, Chicago, IL and his brother, Robert Clifford, Auburn Hills, MI and by several nieces and nephews. Remember Father Clifford in your prayers and gather together in local communities to remember him in Eucharist.